The number of consumers in Western Europe using a subscription video-on-demand service is expected to double over the next five years, according to a new report from Digital TV Research. The number of consumers subscribed to an SVOD service — any streaming video-on-demand platform that requires a monthly subscription, such as Netflix or Amazon — is estimated to jump from 50.34 million at the end of 2017 to 98.85 million by 2023, the report predicts. It said that 2018 alone will account for 15 million additions, while 2019 will bring in another 11 million. The report said Netflix is expected to remain the most used SVOD platform in the region, with 49.75 million paying subscribers in 2023, which is nearly double the 26 million current Netflix subscribers in the region. Amazon Prime Video is expected to have a subscriber base of 22 million by 2023, a significant step forward for the company, which had 3.28 million subscribers in 2015, according to data from Statista. Norway is expected to hold the highest portion of SVOD subscribers by 2023 at 104.8 percent, while Germany, Italy, France and Spain are all expected to fall below the regional average. As a result of the rapid subscriber growth in the region, revenue generated from these services is expected to nearly triple. The report estimates that revenue will increase from $4.44 billion in 2017 to $12.47 billion in 2023. To that end, SVOD will remain the region’s largest over-the-top revenue source, beating out ad-supported video-on-demand, which it first overtook in 2016. SVOD’s share of the OTT total is expected to reach 54 percent by 2023, up from 45 percent in 2017. SVOD growth is fueled by cord-cutters who have canceled their traditional pay-TV packages in favor of a streaming service, and cord-nevers — younger consumers who have bypassed pay-TV altogether. The growth can also be attributed to consumers who are double dipping, subscribing to both pay-TV services and streaming services. Overall, the report predicts that Western European OTT TV revenue will more than double from 2017 to 2023, jumping from $9.84 billion to $23.02 billion. For 15 years we’ve been reminded to “never forget” 9/11, as if we ever could. And yet there are still those who fail to grasp the gravity of the event, as evidenced by the following knuckleheads. A Twitter user visiting Panama City, Florida, during the week of 9/11’s 15th anniversary was struck by this Walmart display commemorating Ground Zero with twin towers of delicious, calorie-free Coke Zero. It’s what survivors of the tragedy would have wanted. Well, besides better pre-9/11 information-sharing between America’s intelligence agencies. Bottomless font of cultural slapstick Florida got back on the board during “9/11 week” in 2015 when the Inverness gun shop paid its respects to the lives lost to senseless tragedy with a $25 discount deal. 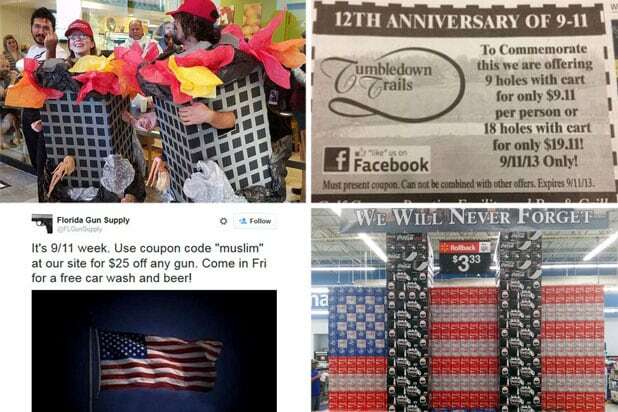 All would-be shooters needed to do to claim the deal was enter the promo code “Muslim” on the store’s website. Really. “Freedom Isn’t Free,” the Virginia yoga studio’s online promotion read, but it is 20 percent off during the anniversary of the worst attack in our nation’s history! In honor of the “patriots who have died for our country,” Bikram Yoga Arlington offered a week of classes for $40 instead of the normal $50 in 2014, and then went all conspiracy theory in defending itself against its detractors. As a “thank you to our heroes who protect and serve our community” in 2012, the Idaho casino offered active military, veterans, doctors, nurses, first responders, air traffic controllers and 911 dispatchers reduced rates on rooms. It included a $9.11 food voucher.